I just returned from three weeks in China, where I have been many times. 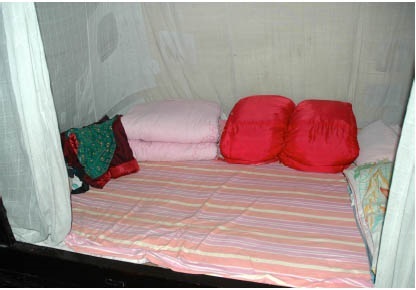 I am a tour director and take people there to see the way of life, not only in the cities but also in the country. Yes, the cities look much like our big cities but the country is developing. In the country, life is still very simple. Several years ago I stayed in a small town in south China for six weeks. The town of Yangshuo is near the city of Guilin. I did not have a car and the way many people travel is on a bike. I rented a bike for a month, and every afternoon I would ride out in the villages. One of my friends that I met in the town was from England and was staying in the country with a farm family. He suggested that I ride with him to meet his host Wendy. She was such a dynamic person I wanted to learn more about her. Now when I take people to this area I invite her to come to lunch and share her story. We then go to her home where she shows our guests what life is like for a farmer’s wife who has now learned English from the tourists. The first time that I met Wendy she was carrying a load of sweet potatoes. I asked her to let me lift the load. I tried and could not get either of the baskets off the ground. 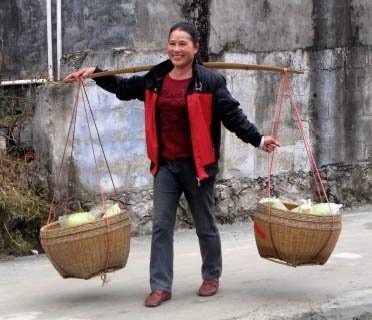 I estimated that she was carrying around 120 pounds on her shoulders. Wendy with her load of sweet potatoes. 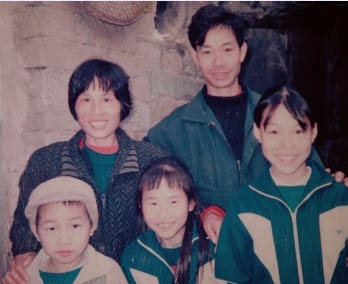 Wendy was born in the early 1960s, when Chairman Mao started the Cultural Revolution. This was a challenging time in China. Many people did not have enough food, and the schools were closed for about 10 years. Wendy did not go to a day of school. When she was born, there was little food and she was not expected to live. There were only two babies in her village that survived the year that she was born. She went on to get married to a farmer. It was at that time that the government decided that Chinese families could only have one child if they lived in the city and two if they lived in the country. Wendy’s first two children were girls. In the Chinese tradition a farm family always wants a boy. It is the custom that the girls will marry and go with their husbands, but the boys will stay and take care of the parents when they become old. Wendy and her husband are the farmers of less than an acre of land, to make a living for their family. If they tried for a third baby they would have to pay a sizable tax to the government. Even though they did not have much money, they decided to have a third child. It was the boy they had hoped for. Because Wendy and her husband needed more money, one of Wendy’s friends who spoke English convinced her that she could take people on a tour around the beautiful mountains where she lives. Her friend made a sign and Wendy began going out and showing it. To her great amazement people asked her to give them a tour, and she began to learn English. Now one of the highlights of our trips is the time that we spend with Wendy, seeing her home. When I saw Wendy a few weeks ago, she was so proud of her family. She now has one grandchild, and each of her children have graduated from college. I am always inspired by her simple life and what she has done with it through all the obstacles that she has faced. She is a true inspiration and is always so happy. This is the cooking area that has a two-burner stove. 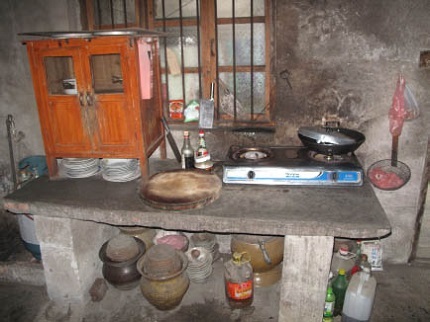 All of the meals are cooked in a wok, and if they have any bread it is a steamed bread because they do not have ovens. 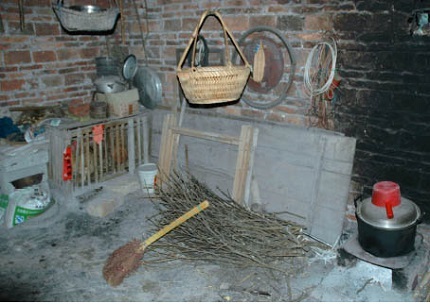 This is the back side of her kitchen, where the chickens live in the cage until they are prepared for dinner. Their bed is a piece of plywood with a little pad over it. This is their toilet that is flushed by taking water with the pan that sits on top of the bucket and pouring water down the hole. 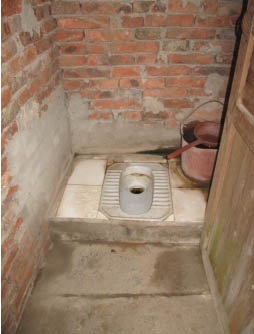 The toilet is about 50 feet away from the building and is what we call a hole-in-the-ground toilet.